The quilt is for Thorge, the baby boy of dear friends. Mother and father took part in almost every little step in the quilt making process and so this construction was the total opposite of my #RainbowMiniSwawpR2. If I had to choose I would rather have feedback on almost everything then feeling so forlorn without it. But I guess as with everything the middle might just be the wisest choice. … and rummaged around in my stash to handpick each fabric. … and to start with sewing the blocks and of course the top. The first blocks where tedious but after one or two it was not difficult at all. Most of them turned out really nice. But be sure to think about the angles twice before putting the blocks together – I had quite some „fun“ with unstitching some wonky, awkward rows. After the top was finished we discussed the backing options. I really wanted to try a pieced backing and fortunately I could convince them. The offer was to piece some more blocks for a vertical strip on the back. This is the only part of the quilt they hadn’t seen before receiving it. I picked scraps from the initial cutting process and cut just one trapezoid of each, put them together in „monochrome“ blocks and finished a rainbow strip. One scrap piece though was not of the original pile and somehow walked over from a different project. Can you spot it? Quilting designs were a bit harder to come up with and they could only decide on one after seeing the mockups. This designs idea was to connect the triangles in a random way to form an odd shape and then to radiate outward (and inward). It reminds me a bit of a topographic map. and the skateboard ramp did just have to be in the pictures. I would have loved to have more time especially to be more careful with the picture details … but for a spontaneous session with an unacquainted quilt holder it was quite addictive. I see more hunts around the city for beautiful picture spots in my future. Maybe even with an assigned quilt holder? But now to the important question: What’s the name of the quilt? The ideas so far where Land of Stories relating to the topography quilt pattern and the handpicked fabrics in ‚I spy‘ or story quality and TriAngels a beautiful wordplay a colleague came up with. So what’s your verdict? Any of the names suitable? Do you have a great idea? And pleeeaaase tell me about your process in naming quilts. I think between those I like TriAngles best. Whatever you call it, the quilt is gorgeous! 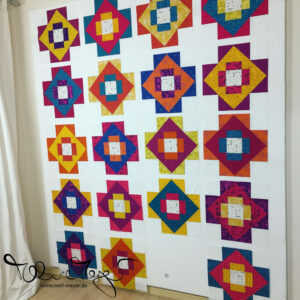 I love the design and the colors and great choice on the quilting! I would name it Monkey Bars. Hi- Great finish and love your choice for photos! 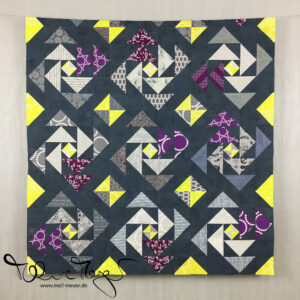 When I look at this quilt, I see Intersections or Cross Roads, not triangles… must be the black and white. I’ve actually never really named my quilts, but often I leave in the salvage or portions of it somewhere so the fabric collection is highlighted by name. Thanks for sharing! Incredible talent! I absolutely love your quilt. I am not a quilter…don’t have the patients. Happened upon your blog through flipboard and felt compelled to comment on your beautiful work. No idea about a name. Thank you for sharing. Oh that is just gorgeous – I love the rainbow of colours and the playpark is the perfect backdrop for the pictures. How about set square for a name? it reminds me of all my geometry sets at school! This one came together almost faster than I could blink! You know that I love the fabrics that went into this – so fun! Well, I think that Hopscotch really is a cute name for this, but I understand that you might want to come up with your own name for it. It makes me think if the candy called Star Burst. It has the rainbow colors and the star design is a nice surprise. Beautiful quilt! I love how the prints you used stand out against the white and gray background pieces. How about naming it Thorge for the recipient? That is such a lovely quilt. 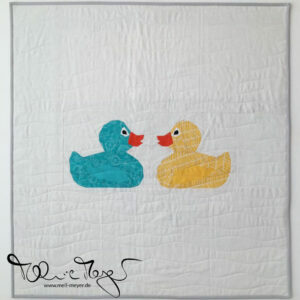 I love the quilting :) I am so bad at naming quilts, I hardly ever do it. So not much help, sorry. So gorgeous!! I love this quilt, no matter what the name is :) Thanks so much for linking up with the Finish-A-Long, on behalf of all of the hosts!